Comfortable and friendly environment, ideal for excursions to the excavations of Pompeii, Herculaneum and Oplontis, a few kilometers from Sorrento and Amalfi Coast, in the heart of the National Park of Vesuvius. In an unreal silence the Villa Anna is the place for lovers of nature, relaxation and culture welcome our guests in a warm and friendly atmosphere with elegantly furnished and equipped with every comfort. Italian breakfast (cappuccino, coffee, tea, croissants and / or cake cutting, toasts and / or bread, jam, butter and honey). What to see & do : We are at 3 km from the archaeological excavations of Pompeii ,all 'inside of the Vesuvius National Park, 20 meters from the terminal service Busvia Vesuvius, 1 km from the excavations of Oplontis Villa Poppea in Torre Annunziata, 1.5 km from the Antiquarian Museum Boscoreale, 15 km from the ruins of Herculaneum, well-connected by a bus service as well as with Circumvesuviana stop at 0 meters from the hotel. The staff provides to those who arrive without their cars for a transfer service to all destinations like, as well as the arrivals of both 'Capodichino Airport from the nearby train station, with the agreement to be agreed. 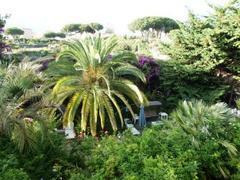 We are also about 40 minutes from Sorrento and about 1 hour from the coast. Just 40 minutes from the archaeological site of Paestum. Near the hotel are guaranteed essential services such as: Civil Hospital in Boscombe Trecase-500 mt. , Tobacco, pharmacy, Food, Bakery, Pizzeria, agritourism, restaurants, etc. - From Rome and / or Naples: take the motorway A3 Salerno-Reggio Calabria you can easily reach out regardless of the toll north of Torre Annunziata, Torre Annunziata South. Then follow directions and always there for Trecase. - From the main railway station of Naples (Piazza Garibaldi): take the Circumvesuviana rail line will arrive in a few minutes at the station Trecase which is a few hundred meters from the the Bed and Breakfast .